VMD is a powerful and intuitive molecular modelling and visualization computer program designed for the modeling, visualization, and analysis of biological systems such as proteins, nucleic acids, lipid bilayer assemblies, and others. VMD can read standard Protein Data Bank (.pdb) files to view more general molecules and display the contained structure. Given its open source nature and its broad system compatibility (runs on Unix, Apple Mac macOS, and Windows), VMD is widely used and highly regarded for viewing and analyzing the results of molecular dynamics simulations. It also includes tools for working with volumetric data, sequence data, and arbitrary graphics objects. 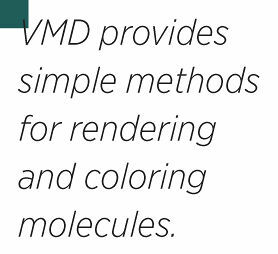 VMD provides simple methods for rendering and coloring molecules for example: simple points and lines, CPK spheres and cylinders, licorice bonds, backbone tubes and ribbons, cartoon drawings, etc. Molecular scenes can be exported to external rendering tools such as POV-Ray, RenderMan, Tachyon, Virtual Reality Modeling Language (VRML), and many others. Users can run their own Tcl and Python scripts within VMD as it includes embedded Tcl and Python interpreters. Also, what makes VMD a powerful tool, is that it acts as a graphical front end for external MD programs such as NAMD, GROMACS, AMBER, etc. VMD takes advantage of multi-core processors and multi GPU accelerated systems. Multi-core CPUs accelerate features including interactive molecular dynamics, bond determination, “within” atom selections and derivatives, so-called streamline or field line visualizations, radial distribution functions, and high quality renderings using the built-in Tachyon and OSPRay ray tracing engines. VMD supports large scale batch mode parallel analysis and visualization on clusters and supercomputers when it has been compiled with MPI support. When running VMD on clusters and parallel computers it is possible to run one MPI rank per CPU core, or more likely, one MPI rank for several CPU cores, or one MPI rank for an entire compute node. If running more than one VMD instance per compute node, it is typically necessary to set environment variables to limit which CPU cores and/or GPUs each VMD instance attempts to use to prevent performance anomalies from arising due to resource contention. VMD is also a powerful tool for data analysis, mainly for structures and trajectories. Various analytical tools are available under the VMD Main Menu item: "Extensions --> Analysis". Furthermore, VMD developers and users often use custom-written scripts to analyze properties of the simulations. VMD has the ability to communicate with other programs via Tcl/Tk. Tcl scripting capabilities are very extensive, and provide multiple opportunities for analysis. Tcl scripting allows the development of several external plugins that works together with VMD. VMD PLUGINS DEVELOPED USING TCL/TK: (FROM WWW.KS.UIUC.EDU) VMD provides simple methods for rendering and coloring molecules.